Stunning tribute presentation to one of the greatest Champions of the Turf Saintly winning the 1996 Cox Plate - Melbourne Cup double with Darren Beadman in the saddle for legend hall of fame trainer The Cups King Bart Cummings. Australian raider Takeover Target showed all of his renowned quality and determination to take out the Group Two King s Stand Stakes in the narrowest of margins defeating the massive 28 horse field. 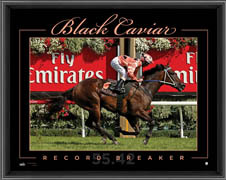 This piece is of one of the greatest champions to ever set hoof on the turf and is a must for all Lonhro fans and racing enthusiasts. 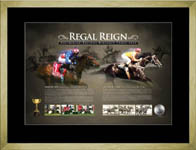 It includes a set of all cerise mini silks the same as those worn by Lonhro s sensational jockey Darren Beadman. This piece includes a set of Northerly s mini silks & an 8in x 12in photo at the top of the great Northerly winning the 2002 Cox Plate which has been personally hand signed by Jockey Patrick Payne. This Mini silks of the great Saintly has the photograph is Saintly winning the 1996 Melbourne Cup which has been personally hand signed Darren Beadman in a permanent marker with a set of Saintly s mini racing colours in a 3D window display. This piece includes a set of Sunline s mini silks & an 8in x 12in photo at the top of Sunline winning the 1999 Cox Plate which has been personally hand signed by Jockey Greg Childs. 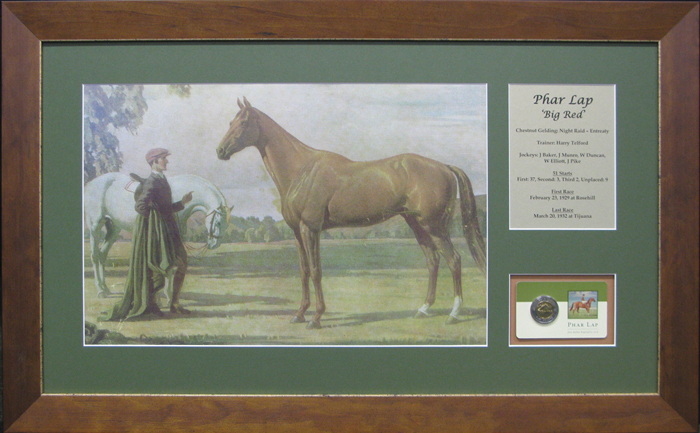 This framed & signed presentation of the great Might & Power has images of Might & Power outstanding career and a photograph of him winning the 1998 W S Cox Plate which has been personally hand signed by "The Pumper" Jim Cassidy . Stunning tribute presentation to one of the greatest Queens of the Turf Sunline winning back to back Cox Plate s in 1999 & 2000 with Greg Childs in the saddle for master New Zealand trainer Trevor McKee.